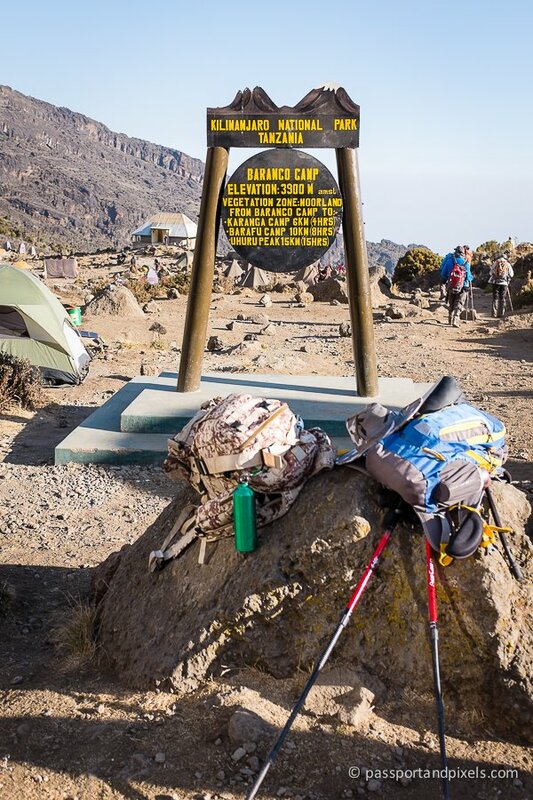 This is the fourth part of my day-by-day account of what it was really like to climb the Lemosho Route up Mount Kilimanjaro. 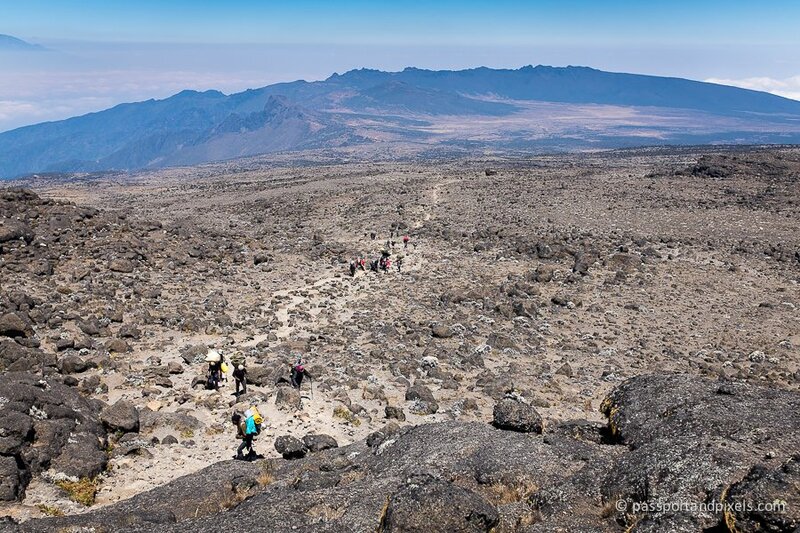 If you missed it click this link to go to Day 3 – Shira Plateau. Today I’ll talk about the walk up to the Lava Tower. We were now almost halfway through the trip, and the altitude was finally starting to affect me. 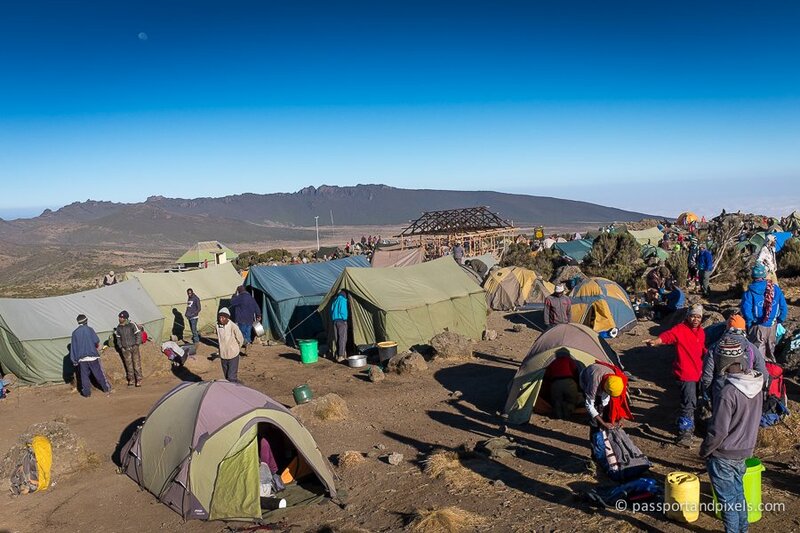 I had a terrible night’s sleep (difficulty sleeping is a common symptom of mild altitude sickness), and on top of that we were parked on a slope so I kept sliding down to the bottom of the tent, which as anyone who has ever been camping knows is not very comfortable! So after lying awake for about four hours I resorted to taking a sleeping tablet in an effort to get at least a few hours rest. 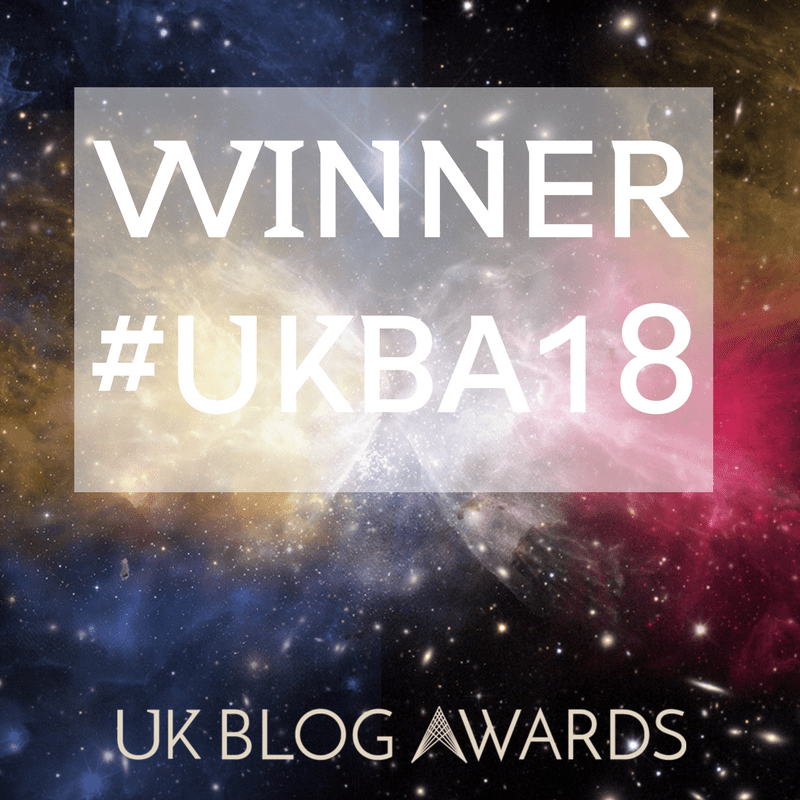 Of course, that meant that in the morning I was stupidly groggy, my arms and legs were leaden and I felt terribly lethargic. Not good when you’ve got a mountain to climb! 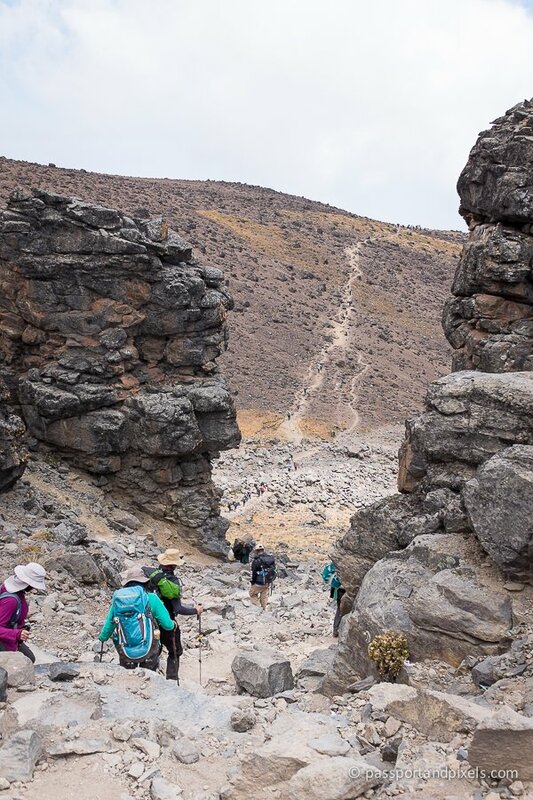 I was also told off by John, our lead guide, for taking the tablet, because if my symptoms had become worse in the night I might not have woken up – which would have been Not Good (technical medical term). 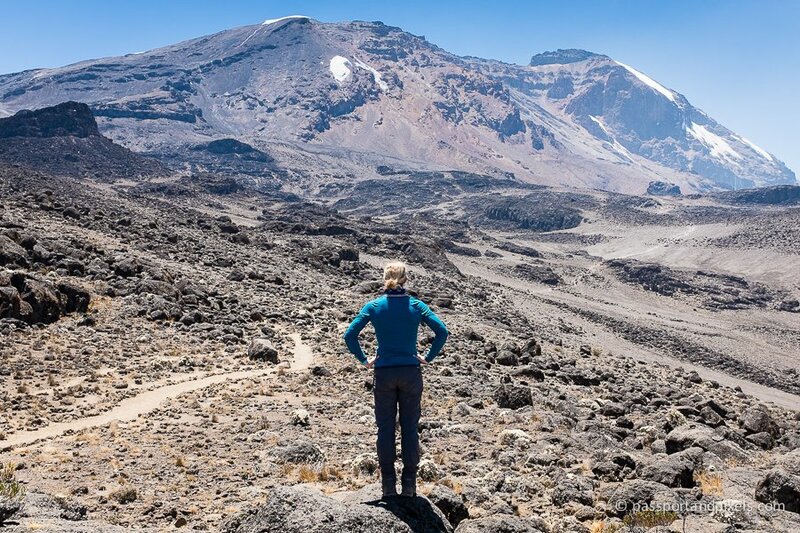 So here’s my top tip for Day Four of climbing Kilimanjaro: suffer the insomnia! Like several others in the group, the altitude also caused me to start having problems with my airways. I’d developed a persistent cough, probably caused by breathing in so much dust, and by the end of the previous day my nose had become super congested and irritated. The combination of the dust and minor baby nosebleeds meant the contents of my handkerchief were not pretty! Sorry if this puts you off your breakfast, but I did promise to tell the truth, the whole truth, and nothing but the truth… Anyway suffice it to say I was extremely pleased I’d brought a clean hanky for every day and I most certainly used them! If you want more information about what else I recommend you bring, check out my Packing List. So with the hangover from the sleeping tablet, and my breathing issues, walking was tougher than on previous days. But I still managed to get the camera out to take a few pictures. And thanks to the fact that we were doing the trip in September – the dry season – we were again treated to another stunning morning. 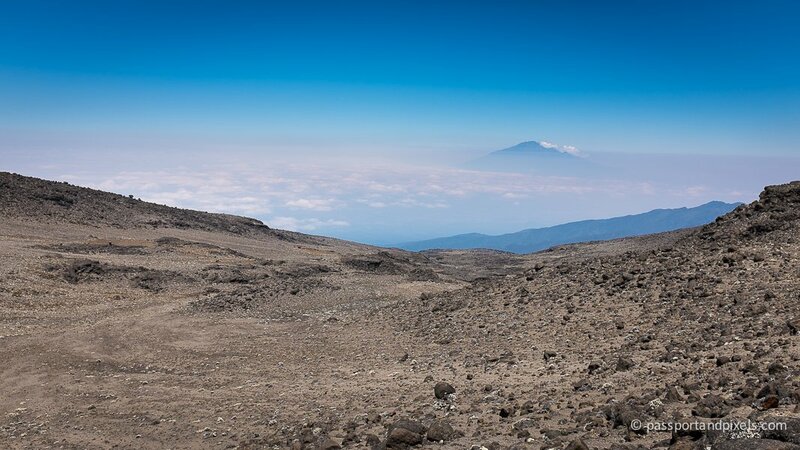 …while looking back we could see the dormant volcano Mount Meru appearing to float above the clouds. 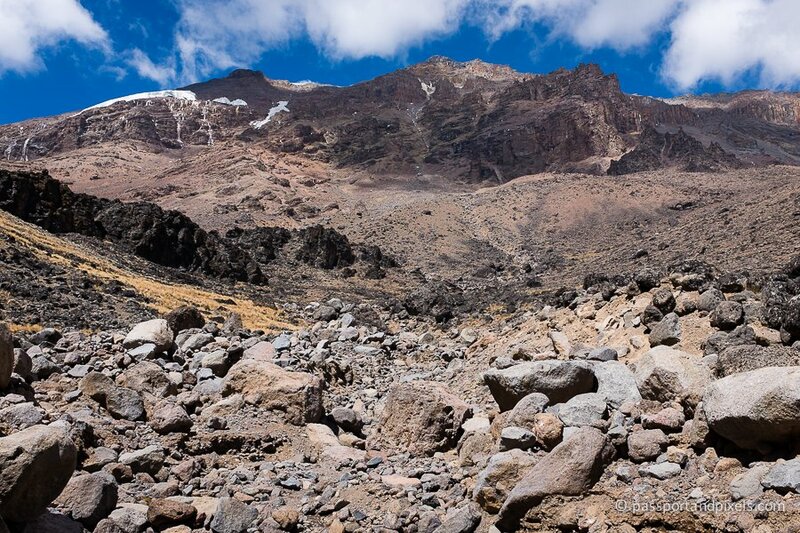 At 4,562 m Meru is the 2nd highest mountain in Tanzania and the 5th highest in Africa. 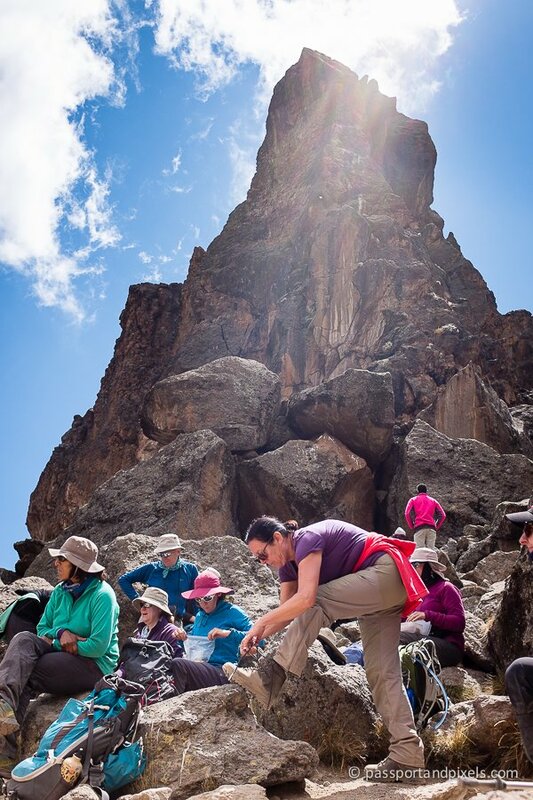 But we were already higher than the top of Meru, because by lunchtime we had arrived at the Lava Tower, at 4,600 m.
The Lava Tower is a 300-foot-tall rock formation that (you guessed it) was formed from lava, way back when Kilimanjaro was still an active volcano. According to our guide, the lava spurted out of a vent, cooled, and hardened, plugging up the vent below. 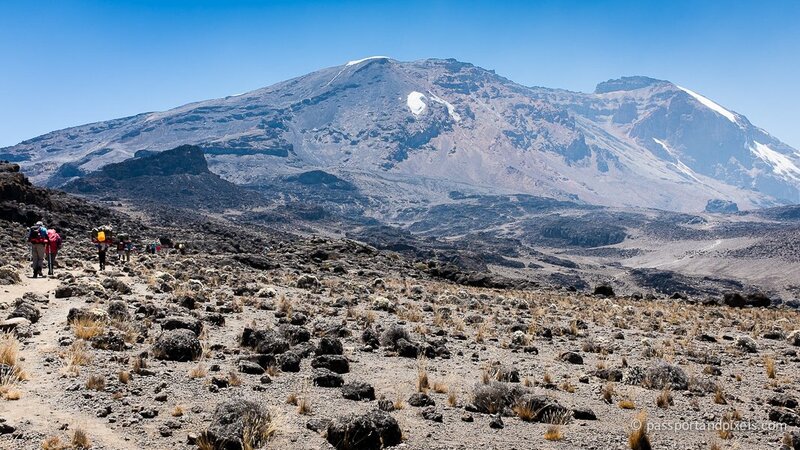 On active volcanoes, plugs like these can cause pressure to build up below the surface, potentially leading to violent eruptions. 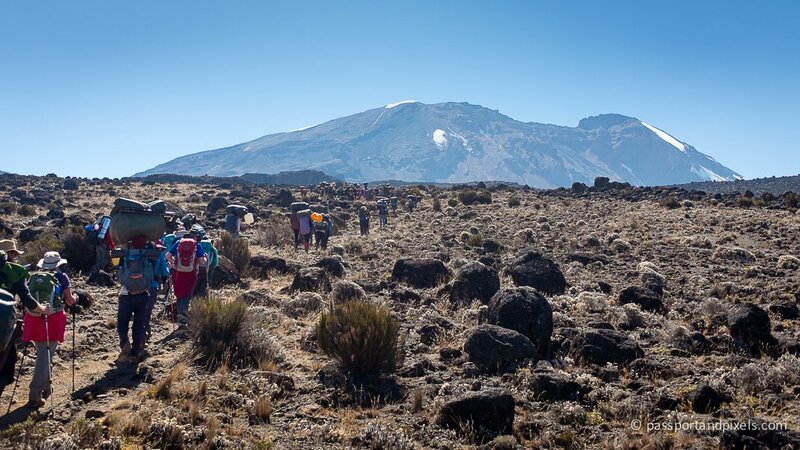 But luckily for all the hikers and tour companies, even with this rocky cork stuck in her side, Mount Kilimanjaro has kept quiet. At 4,600m, our lunch spot by the Lava Tower was the highest we’d been so far, and would be the highest point we’d hit until we got to Base Camp in two days’ time. And the difference in altitude was obvious – and disconcerting. 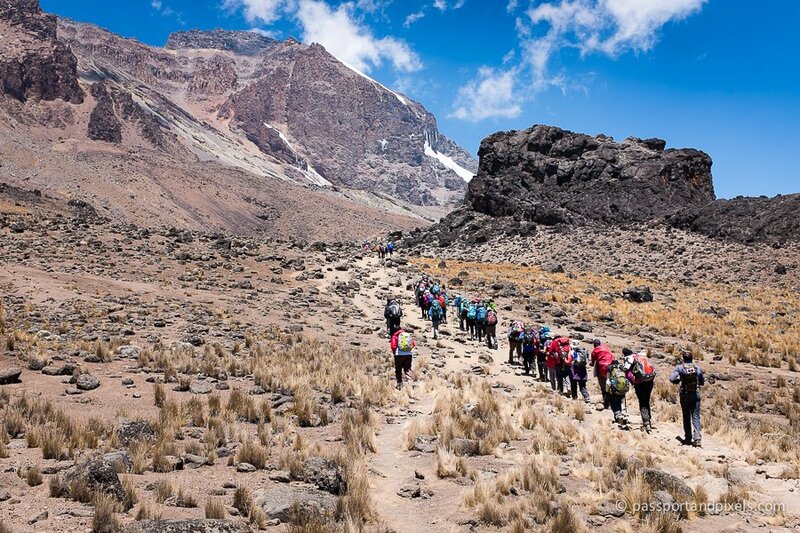 When you’re walking uphill at altitude you get short of breath fairly quickly, and although it’s unusual to be so breathless just walking, if you’re used to doing more strenuous exercise it doesn’t feel odd because you’re moving. But when we sat down to eat at the Lava Tower and I was still struggling to breathe… well that was weird. And not at all pleasant. I was very relieved when we began the descent into the next valley – though wasn’t too keen on the look of the steep uphill on the other side. 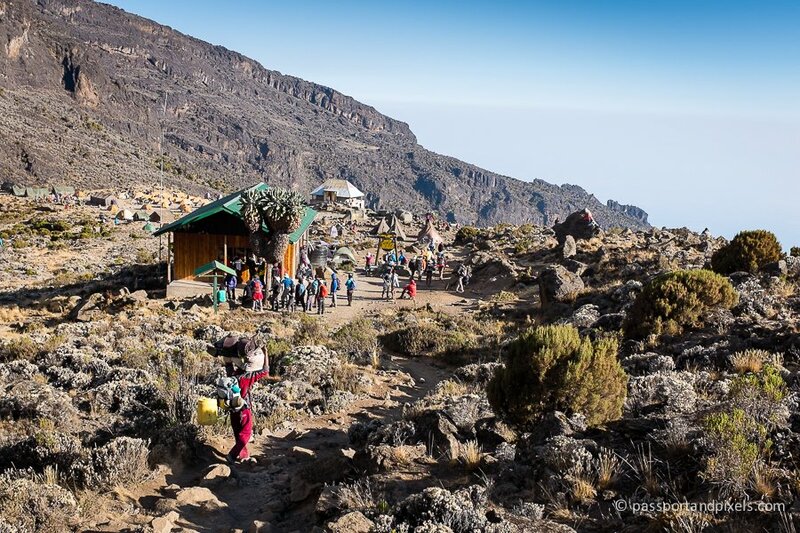 But before we left our Lava Tower lunch spot there was just time for a quick ‘Diamox wee’ in one of the most spectacular outdoor toilets I think I will ever have the pleasure of using! Check out this view, literally taken from the ‘ladies’ room’! Rather this view than the inside of a portaloo every time! The rest of the day was all downhill, through a fantastic otherworldly landscape populated with plants that wouldn’t have looked out of place in an scene from Star Wars. These Senecio trees, or giant groundsels, were particularly weird and wonderful. 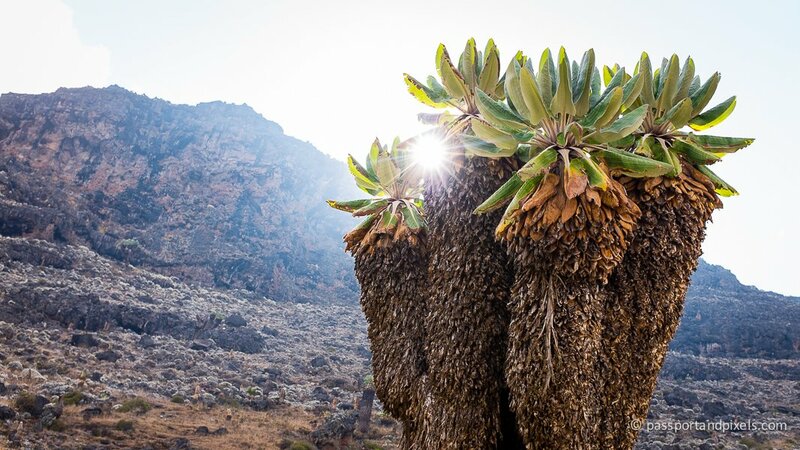 They’re unique to the upper slopes of the mountains of East Africa, and we were told they only grow a new branch once every 25 years. So the one below must be at least 100 years old. They only grow where there’s a good source of water, so in times gone by intrepid adventurers on Kilimanjaro would know where to look for a drink by spotting one of these bad boys. 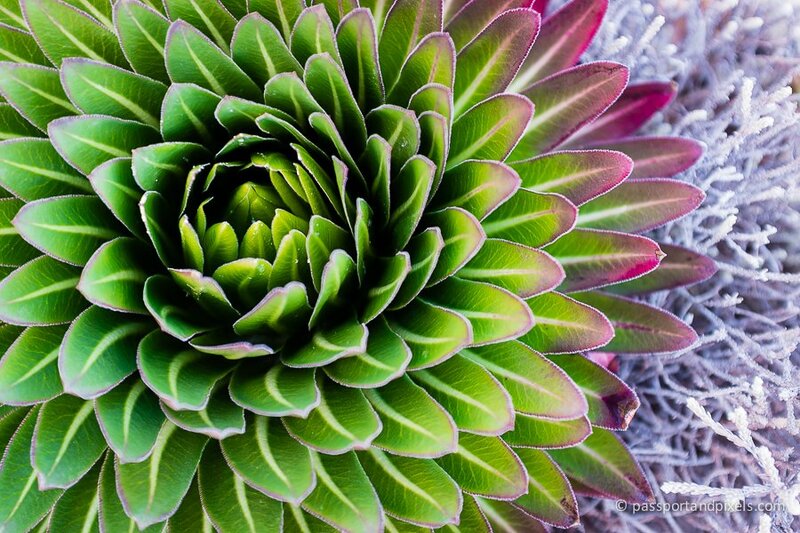 These giant lobelia plants added to the general feeling that we were on another planet. 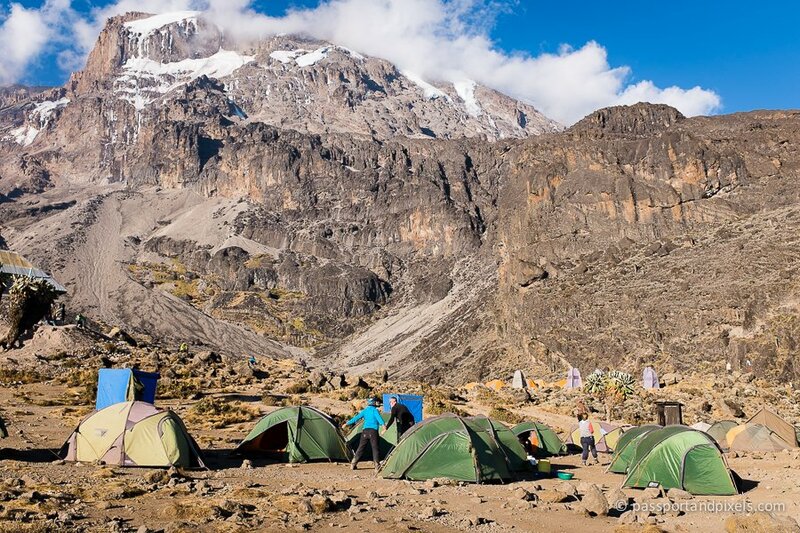 But after stopping repeatedly to take photos of the Kilimanjaro plant life and getting totally left behind by the rest of the group, I eventually made it to our base for the night: Baranco Camp at 3900m. 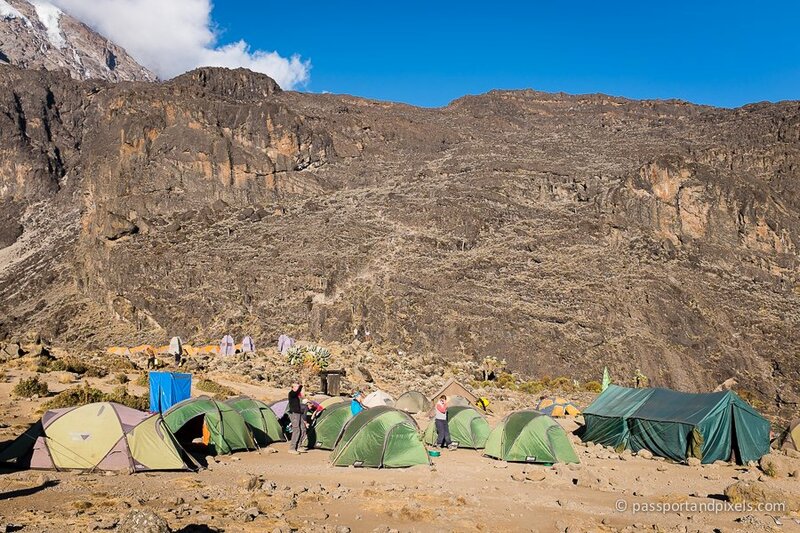 Baranco Camp is situated directly beneath the daunting Barranco Wall, famous amongst Kilimanjaro climbers for being the steepest and most technically tricky part of the entire ascent. And it’s what we had to look forward to first thing tomorrow morning. It looks pretty death-defying, doesn’t it?! 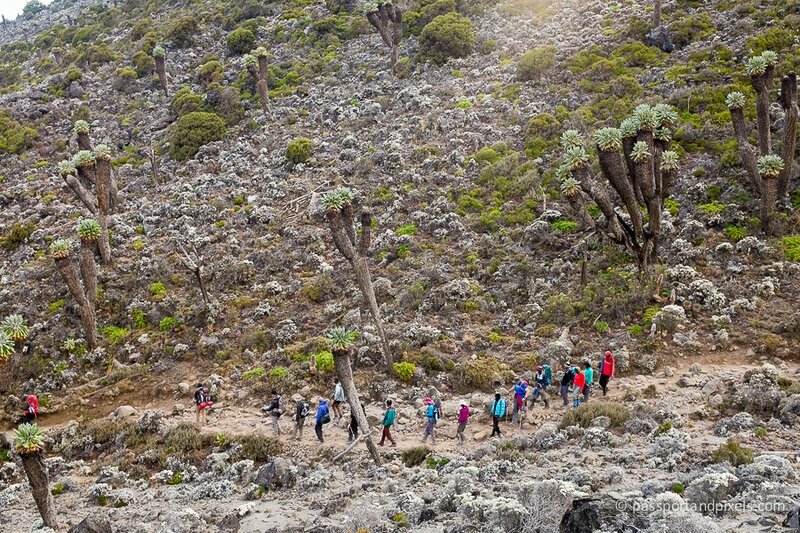 To see how we got on, click here to go to Day 5 – Barranco Wall.